The West Against Racism Network (WARN) would like to invite you to take part in a new and exciting anti racism initiative for West Belfast –‘Cairt Fhrith-Chiniochais Iathar Bheal Feirste or the Anti Racism Charter for West Belfast’. As you may be aware the West Against Racism Network has been working for a number of years now to actively promote an anti racist culture in West Belfast and to make West Belfast somewhere that racism in any form has no place; amongst the successful initiatives it has undertaken to date have been a Welcome Pack ‘Comhar na gComharsan’, for migrant families moving to live in West Belfast, an anti-racism Pubs and Clubs Initiative, Wall Murals on the ‘International Wall’, and an anti racism ‘Republic of Conscience’ passport. Your organisation may indeed have been involved in or supported some of these initiatives in the past. West Belfast has a well deserved reputation of being a welcoming community, with a proud history of working towards a more equal and inclusive society for all. Sadly racism in Belfast and elsewhere has been steadily on the rise in recent years; the appalling attacks on members of the Roma community in the summer of 2009 was but one example of this. Racism ruins lives – it devastates the victims but it also damages the social and economic fabric of communities. The challenge of ensuring that our community in West Belfast is one in which there is no place for racism is one we are all concerned with and one which we can all contribute to achieving. This Anti Racism Charter initiative allows you to play your part in this. 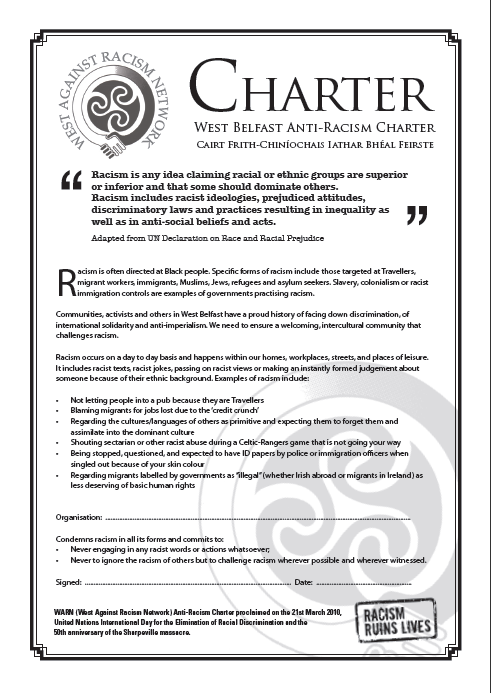 The format for the Anti Racism Charter is that of an attractive one page black and white Charter document which includes an explanation of what racism is along with some examples, and pledges the signatory not to engage in racist words or actions and to challenge it wherever and whenever it occurs. It includes a space for signature and can be provided in various sizes, including A2, A3 or A4 size. While WARN will provide the Charter itself free of charge, for a contribution of £5.00 WARN will supply a durable, laminated version of the Charter for display in your premises. 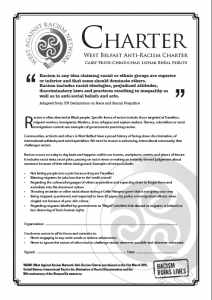 We are inviting your organisation to sign the Charter and to display it prominently in your premises, thereby communicating a clear message that you do not support racism and that you are doing your bit to challenge it. To indicate your interest in becoming part of this important initiative please email us at westagainstracism@googlemail.com . Please also indicate whether you would like WARN to supply you with a framed copy of the Charter.